Doulton’s advertising figure Tsang Ihang. 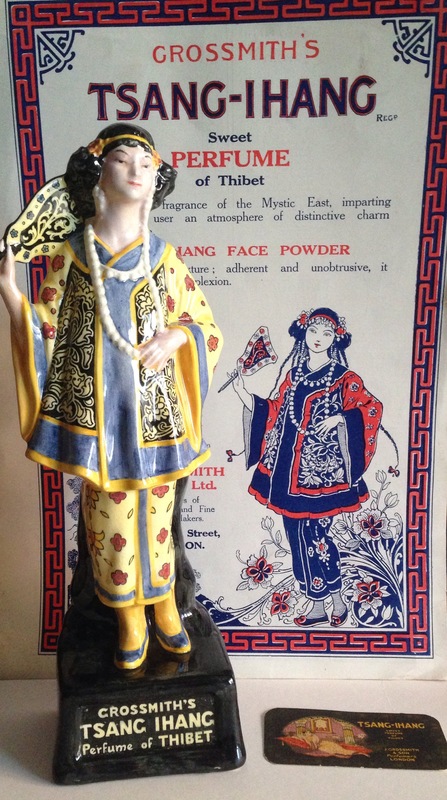 Back in the 1920’s Doulton produced a handful of so-called advertising figures such as Tsang Ihang here and also The Yardley’s group and the Perfect Pair made for the publishing house behind the Tatler and Eve magazine. There were other figures too but produced without HN numbers such as the Standing Beefeater for the Illustrated London News and of course the delightful Sketch Girl. It took many decades to eventually track the original advert down featuring the Tsang Ihang lady, but fortunately we did just before the book Reflections was published. I see that someone online has used a black and white version of it we used as the end papers so I thought it time to show this coloured version. Naturally once one has been found others crop up too, which is the good thing about collecting so I am sure collectors will be able to track down their own copies to use in your their displays.